Battle for the Mountain rages on! Trying a small process change. Still feeling it out. The original name of Selkie's final card was "Monster Bait", but then I said it out loud and there was no way. Hope springs eternal. Look at them ‘play’. I’m loving Amanda’s, “Good at traps.” retort and how she dances over each trap. She seems to be controlling her temper quite well here, I hope she manages to continue to do so. Selkie seems to be getting quite frustrated on the other hand. I like how you’ve made both girls sort of do the same thing. Why isn’t this game a real game? Some one should make it and put it in the stores for X-mas. I would buy this game to sit on my shelf with all the other super cool board games I have that my teenager will not play with us any longer. He just blew off Call of Cthuluhu Game Night for the release of Fallout 4. I am old… Sigh….. In his defense I would too cause Fallout is awesome. And I am old too lol. Hm, they’re both out of cards now, aren’t they? That look on his face says “I’m going to crush my daughters”. I love Amanda’s “it’s super effective” sass on panel one. Not only is it genuinely funny, it’s also not aggressive. They are playing now, not fighting… even if they get a little caught up in it. Selkie’s final card was “Monster Bait”, but then I said it out loud and there was no way. Genesee: turns out that Selkie has always been Amanda bait. I’m glad that seems to be changing. I wonder if Todd will ever know what happened to Mandy while in the ‘care’ of the other family? If that’s the type goat Andi kicked in the face, I’m impressed. Reminds me more of a Minotaur. 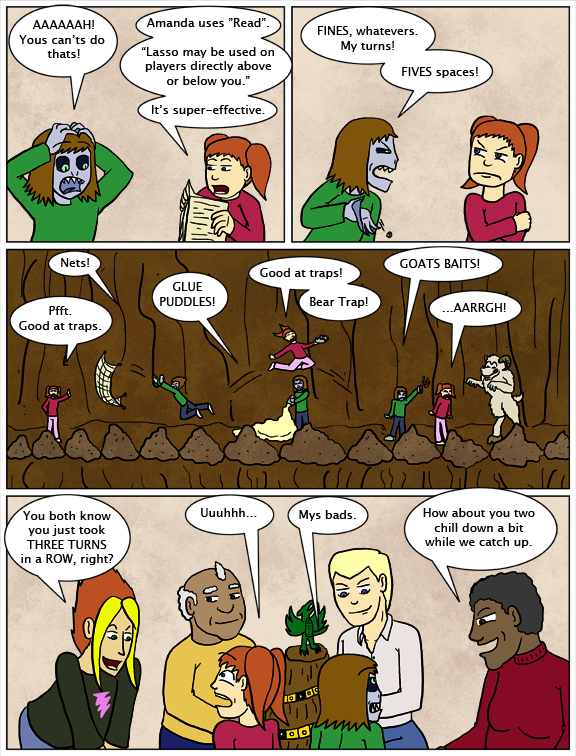 Maybe it’s too many years of D&D, but to me, “good at traps” means she has a better chance than the others of not getting caught – not that she can just skip merrily past them. I know – different game, different rules. Just “feels” wrong. I have just spent the past week reading this comic. I nearly cried when I realised there wasn’t a next page. I must have missed something, but I thought the others were all out. Except Andi, who took herself out just so the two of them could face off and work out their angers. They fell to the bottom and have to start over, while the girls are midway up. Selkie WAS the furthest up, then a lasso happened. Oh righto I get it, so they’re the only contenders at the moment but the others don’t have to just quit. That’s a good game. Question, what did Amanda’s bear trap do to Selkie? If you fail to beat the bear trap you can not move past that square until your next turn. So did she beat it? I assume she did because she played her other card or does it just prevent you from moving? Preventing from moving seems just that, no moving, but you can still play cards. Which seems to be the case here.